Electrolytic capacitors have rated voltage like 10V, 25V etc. This is the maximum value of voltage that can be allowed in the capacitor. As a rule, the voltage rating of the selected capacitor should be three times higher than the voltage in the power supply. For example, if the power supply of the circuit is 6 volt, then the capacitors should be more than 18 volts types. Nearest value is 25 volts which can be used. But if the capacitor is connected to a section of the circuit with less than 3 volts, you can use a 10 volt capacitor. So first determine the voltage in the section of the circuit and select the capacitor. If the voltage rating is higher like 25V or 40V, it will not make any harm. Smoothing Capacitor is used to generate ripple free DC. Smoothing capacitor is also called Filter capacitor and its function is to convert half wave / full wave output of the rectifier into smooth DC. The power rating and the capacitance are two important aspects to be considered while selecting the smoothing capacitor. The power rating must be greater than the off load output voltage of the power supply. The capacitance value determines the amount of ripples that appear in the DC output when the load takes current. For example, a full wave rectified DC output obtained from 50Hz AC mains operating a circuit that is drawing 100 mA current will have a ripple of 700 mV peak-to-peak in the filter capacitor rated 1000 uF. The ripple that appears in the capacitor is directly proportional to the load current and is inversely proportional to the capacitance value. It is better to keep the ripple below 1.5 V peak-to-peaks under full load condition. So a high value capacitor (1000 uF or 2200 uF) rated 25 volts or more must be used to get a ripple free DC output. If ripple is excess it will affect the functioning of the circuit especially RF and IR circuits. See the smoothing capacitor used in this circuit is 470uF.The value can be 470uF to 1000 uF in the power supply of circuits except audio circuits. Here the smoothing capacitor is 4700uF 50V because the power supply is that of an Amplifier circuit. If the smoothing is not perfect, humming noise will appear in the speaker. If your amplifier is humming, add a high value capacitor parallel to the existing capacitor and ground its negative to the metal chasis of the amplifier. Hum sound will stop. 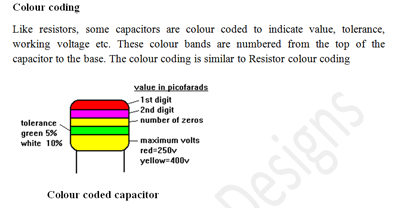 Now let us see the use of capacitors in the various parts of the circuits. 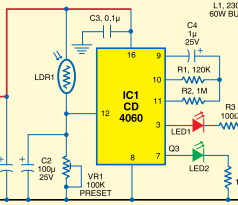 Here a binary counter circuit is designed using IC 4060. The IC oscillates only when its reset pin 12 is low. A capacitor C2 is added to pin 12 as a buffer. This prevents false triggering if the LDR is affected by a shadow momentarily. The capacitor will keep pin 12 high even if the LDR becomes non conducting for few seconds. See the capacitor C3 is added to the Vcc pin of IC. This also acts as a buffer and keeps the Vcc at pin 16 stable to maintain stable operation. Minute voltage fluctuations at pin 16 can change the timing cycle of the IC. See a capacitor is added at the base of T1. This is a must in photo sensor circuits to avoid Relay clicking or chattering. When we use LDR, Photo diode etc in light sensor circuits, at the time of transition of light, the relay will switch on / off frequently. Adding a capacitor at the base of the relay driver transistor can solve the problem. It will act as a buffer to maintain the base voltage of the relay driver transistor and provides a short delay. This makes the relay switching clean. You can use a value between 1uF to 100 uF. If the relay clicking is continuing, use a high value capacitor like 100uF or 220 uF. Here a capacitor C3 is added at the gate of Triac that controls the load such as bulb. This capacitor keeps the gate current steady so that the Triac will be full on to drive the load. It also provides a short time delay before switching on / off the Triac which is useful for maintaining the stability. This is a Lamp dimmer circuit controlled by the Triac. 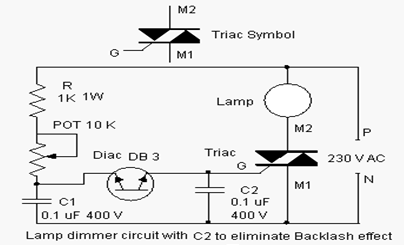 This circuit will face the problem of Backlash effect if C2 is not at the gate of Triac. When the Triac is turned off fully by rotating the Pot and then turned on, the Triac will not conduct fully and the lamp will not turn on completely. Adding a cap will rectify the problem. See it is an AC capacitor rated 400 volts because the circuit is directly connected to the mains. Here is another lamp driver circuit using Triac. Resistor R1 and the capacitor C1 act as a Snubber network for noise filtering. AC hum and interferences in the mains will affect the working of the lamp. So snubber is a must in such circuits. This is my transformer less power supply circuit published in Electroschematics.com. Transformer less power supply is used in some gadgets due to its low cost and low space consumption. But the circuit has no galvanic isolation, so it can be dangerous to the circuit if the AC capacitor fails. It can also give a fatal shock if handled carelessly. The AC capacitor C1 is rated 400 volts and drops 230 volts to around 25- 40 volts AC depending on the input voltage. 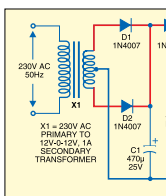 Use the transformer less power supply only in cheap circuits. If it is used in circuits using costly ICs, if the cap fails, the whole circuit will be destroyed. Do not use this kind of circuit as battery chargers. 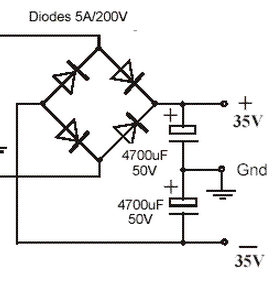 Output AC voltage from the capacitor depends on its value. The given formula is used to calculate the output current from the cap. But maximum current will be around 100 milli amperes with 1uF capacitor. Note that the Bleeder resistor R1 is a must for the circuit because the Cap will store voltage even if the main supply is cut off. The bleeder will remove the stored voltage. Its value can be between 470K and 1M. Disc caps are of different types which are mainly used for noise filtering, coupling, de coupling etc. 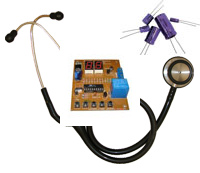 These are mainly used in radio frequency circuits. The capacitors are identified using the code numbers printed on the capacitors. The table shows the code and values of common disc capacitors. You can use the buttons below the article. If you like the article Like and show your interest. You can rate the article for improvement. If you want to share in Facebook or other media Share it. You can make comments in the column below to make the article interactive.